On Saturday 17th February 2018 Cleo is finally heading off to her new forever home with James and his family. We wish them all lots of fun and happiness together. Bella has been reserved by the Shallcross family from Cheadle and has been given a new name of Cleo by James, will be her main handler. Good luck to you all. 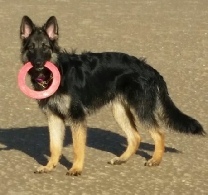 Bella is a very intelligent, sweet natured, entire (Breeding Restrictions will NOT be lifted) Black and Tan, long coat girl who is looking for a new home through no fault of her own. She is the grand daughter of Woody (Rockforce) and the daughter to Cruz (Rockforce). 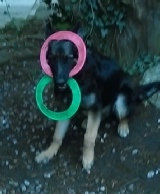 Her elderly owner is no longer able to keep up with her and she has reluctantly returned her to the breeder. Bella is just an inoffensive, giddy 9 month old puppy (Born April 2017) who is desperate to please but hasn't really been shown any consistent training. She responds quickly if shown as she just wants to do it right. 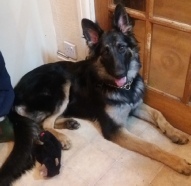 Bella is extremely trustworthy and kind and is very confident with people and dogs, she would do very well with an experienced GSD family who can guide her as she does lack basic training. Her elderly owner has obviously loved her dearly but Bella needs a lot more out of life as she is up for fun, jumping in muddy puddles and generally being mischievous. Bella would do well with an active outdoor type family or someone interested in starting in working trials/obedience as she really is up for any challenge; a real adventurer. She is currently residing in a kennel so is desperately in need of a stable, loving environment. Tel No: 0161 941 5699.